I love my crock pot! I absolutely love it. It makes dinner so easy to make and so easy to clean up.. I really need to use it more often, but the only downfall to the crock pot is that you have to plan out your dinners, since you have to throw everything in several hours before you eat. But then you can go to work or run errands or do other things around the house and dinner just cooks itself leaving the house smelling so good. I should really strive to cook more crock pot dinners… the positives far out way the negatives (WAIT there are no negatives in my book). Another fellow blogger also wanted to use her crock pot more so she challenged herself to use it every day for an entire year. On the blog A Year Of Slow Cooking, Stephanie O’dea, chronicles her adventures in the kitchen using her crock pot for an ENTIRE year (that’s 365 recipes)! She has everything on her blog from dinners, to side dishes, to desserts. If you have not checked it out yet you should (I strongly recommend it)! So far I have tried two recipes from her blog and both have turned out wonderfully. 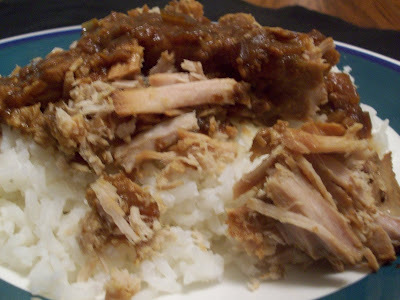 This recipe for Asian Pork was delish! The pork was so tender it just fell apart. I served this pork over white the next day everyone in my office was talking about how good it smelled! This is defiantly a keeper. Use a 4-6 quart crock pot. Put onion slices into the bottom of your crock pot. Put the pork on top. Add brown sugar, soy sauce, vinegar, water, garlic, and peanut butter. No need to stir–the peanut butter needs to melt before you can do so. Cover and cook on low for 8 hours, or on high for 4-6. The pork will be more tender the longer you cook it. 1 hour before serving, flip the meat over in the crock pot to allow the other side to soak up the peanut buttery goodness. Garnish with chopped peanuts (optional).